We specialize in frequency agile lasers for atomic, molecular, and optical (AMO) physics, with applications in cold atom experiments, spectroscopic sensing, and more. Our lasers are based on short cavities, which make them robust, reliable, and small. Our philosophy is to design and build the laser with its intended use in mind. For our short-cavity laser products, this means locking to and scanning around specific atomic or molecular transitions and/or cavity modes with robust, vibration immune, and trouble free stability. To realize frequency-agile, trouble-free stability, we specifically avoid piezo and/or mechanically actuated gratings and mirrors. Such mechanical elements can enable larger wavelength tuning around a diodes gain curve, but this comes at a significant cost. Specifically, the mechanical mechanisms provide a pathway to couple vibrations into the laser cavity, adding expense and complexity, providing a point of wear/fatigue which limits the lifetime, and necessitating an undesirably long laser cavity. The long laser cavity requirement is perhaps the most detrimental. This decreases the free spectral range, which limits the injection current mode hop-free tuning range. Injection current tuning is much faster (up to GHz) than any piezo or mechanical element, which means that it is a potent knob for laser frequency control, whether it is for feedback during locking, or frequency jumps during atom trapping and cooling. Specifically for locking, since piezo’s have a limited bandwidth (typically <10 kHz), they of course have limited utility when responding to acoustic challenges which can have frequency components of 10’s of kHz. The high-bandwidth injection current is the most potent technique for responding to such commonplace challenges, but, with traditional long-cavity designs, the necessarily limited mode-hop-free tuning range dramatically limits the dynamic range of this approach. With our non-mechanical/piezo-less and short cavity designs, we have both inherent stability and large mode-hop-free injection current tuning. This provides trouble-free, very stable locking and injection-current control. While we understand that the mechanically and/or piezo actuated diode laser systems has been the AMO default for the last several decades, our laboratory and industrial experience has motivated a different approach. If your application does not require long-range tuning but rather requires robust and reliable locking and scanning around a specific frequency, then don’t incur the cost and substantial performance expense associated with prior mechanical approaches. 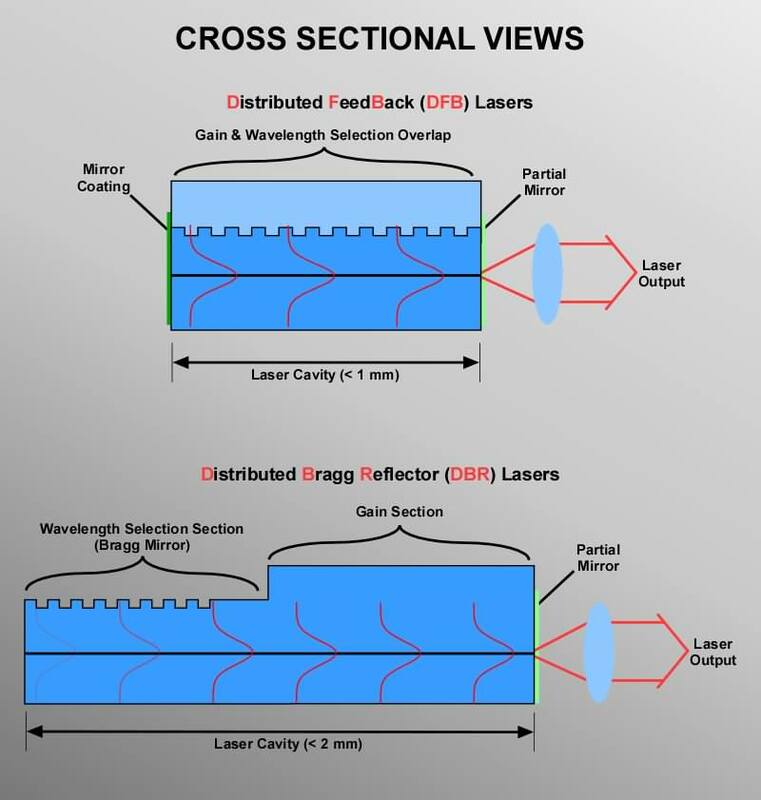 In the rest of this section we will very briefly review diode laser and then discuss our two short-cavity designs: fully integrated structures (DFB & DBR) and our Chip External Cavity diode Laser (CECL). Most scientific and AMO diode laser experiments utilize the ubiquitous Fabry-Perot semiconductor laser chip. This chip is a minute self-contained laser especially when compared to other non-semiconductor based laser cavities. 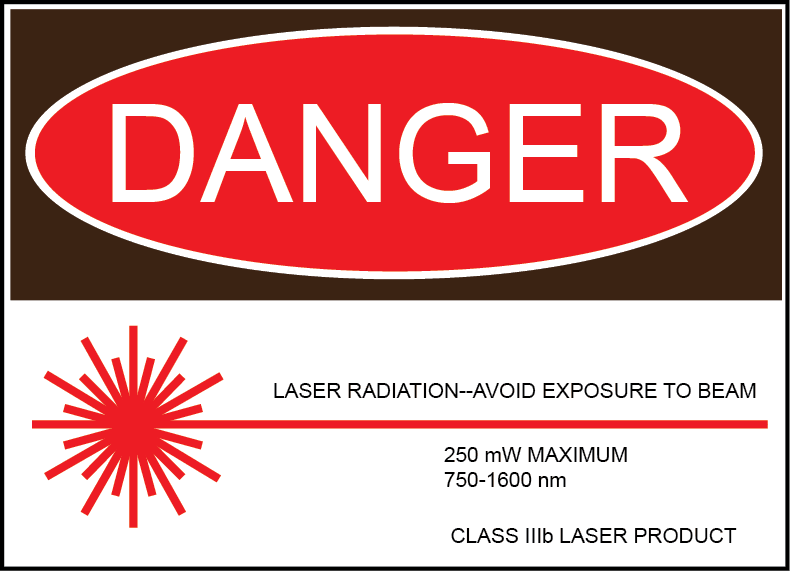 The small size and scalability of manufacturing enabled wide-spread commercial acceptance of laser technologies. The Fabry-Perot cavity is typically a channel waveguide structure with lateral confinement either provided by a topological ridge (index guiding) or an electrode pattern which creates lateral charge density variations (gain guiding). The ends of the diode chip form the ends of the laser cavity. Typical dimensions for a spatially-single-mode device can be in the range of hundreds of microns long, by 3 microns wide, by 0.3 microns tall (this 3 × 0.3 µm cross section explains the elliptical output beams). With the invention of the Fabry-Perot laser diode the world now had a low cost, simple to drive, and manufacturable source of spatially coherent light. As is well known this technique (along with the related VCSL) brought on bar-code scanners, compact discs, laser pointers, fence-line monitors, and many more non-laboratory applications. While the Fabry-Perot laser diode has truly been disruptive, from an industrial and commercial point of view it’s most important attribute is spatial coherence, i.e., it was a bright and spatially well defined light source. From a scientific perspective, while the spatial coherence of lasers (i.e., all the photons are going in the same direction) is appreciated and utilized, the temporal coherence of lasers (i.e., all the photons have the same energy) is equally and often more important. The common Fabry-Perot laser cavity does not contain any frequency selective elements. The lateral and vertical spatial confinement can guarantee a single spatial mode, but there is nothing to guarantee a single longitudinal mode. Stated simply, in the frequency domain, the laser is multi-mode. For applications the require control of the temporal coherence or frequency, a wavelength filter or wavelength selective element needs to be incorporated into the cavity. The largest commercial application for temporally coherent, i.e., frequency single-mode, lasers is wavelength division muliplexing (WDM) in telecommunications. This substantial market has driven the development of distributed feedback (DFB) lasers and distributed Bragg reflector (DBR) lasers. In these lasers a Bragg grating structure is integrated or incorporated directly into the semiconductor chip. For DFB lasers the grating section fully overlaps with the gain section and occupies the whole of the laser cavity. With DBRs the grating section is spatially separated from the gain region. Sometimes there can be multiple gratings or mutli-section gratings that enable longer vernier tuning, though these are more complicated to make and control. All of our products use a single grating element. There is a vast body of prior work on different approaches for making the grating structure and even the design of the grating itself (e.g., single or multi-order gratings). Some examples include holographic patterning, direct e-beam writing, and nano-imprint lithography. With our DBR products that utilize chips produced by Photodigm the gratings are holographically written. Telecom DFB lasers are also typically holographically written. For shorter wavelength devices, the grating pitch must decrease, even with the use of multi-order gratings. This explains why GaN based blue DFB or DBR lasers are not available. Both DFB and DBR lasers are extremely immune to vibrations and are very rugged, stable devices. The cavity length is typically on the order of 1 mm, usually slightly shorter for DFBs than DBRs. Laser tuning is realized non-mechanically via temperature and injection current. The temperature is used to coarsely tune the wavelength, typically over a few nanometers. Once the laser wavelength is close to the atomic or molecular transition that is desired then the temperature typically does not need to be changed. Shorter range tuning, or what we often refer to as frequency (rather than wavelength) tuning, is realized via injection current. Injection current alters the lasers frequency both via a change in the charge density and local heating. The frequency of DFB and DBR lasers is considerably more sensitive to changes in current than a large cavity external cavity diode laser (ECDL). This is advantageous because it enables rapid detunings and servo-loop responses to external challenges. That said, this increased sensitivity also necessitates a low noise current source to ensure that current noise does not contribute to the laser linewidth. With our D2-105 current controller we typically observe DFB linewidths of ~1 MHz and DBR linewidths of ~700 kHz. The temperature sensitivity for these devices also necessitate a tight and fast thermo-optic design. Our D2-100 laser package has a two stage thermal loop design that provides fast local temperature control directly on the diode chip and stabilization of the outer housing, to provide isolation from outside temperature variations. Because the total cavity length is so small the free-spectral range is quite large. This enables long-range injection current tuning without mode-hops. For DFBs, since the injection current tunes both the gain and wavelength section, this is especially long (it can sometime be hard to realize a mode hop). 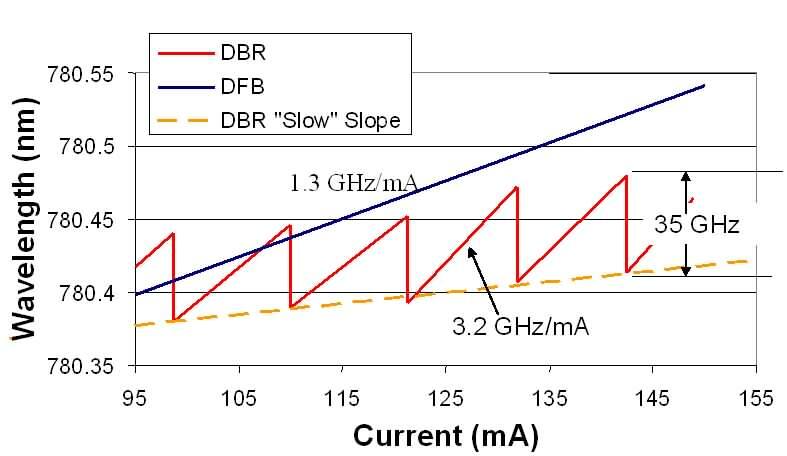 For DBRs, since the wavelength section is not changed with injection current mode-hops can be realized, though they are very repeatably and controllable. For our 780 and 852 nm DBRs the injection current mode-hop-free tuning range is >30 GHz, more than enough to scan across the ~10 GHz wide hyperfine spectral features of the D2 lines in Rb or Cs. Furthermore, this large range enables the user to directly modulate the injection current for putting sidebands (out to several GHz) on the laser. This can replace external AO or EO modulators saving cost and complexity. While fully integrated lasers such as DFBs and DBRs provide excellent ruggedness, are very compact, and a long mode-hop-free injection current tuning, they do have limitations. First, the very short cavity, coupled with spontaneous emission noise, results in a larger linewidth (typically ~1 MHz). For some applications this is too broad. Secondly, a full grating design and manufacturing run is required for each wavelengths. If your experiment requires a “non-typical” wavelength, then they might not be available. These two drawback motivated our development of our CECLs. 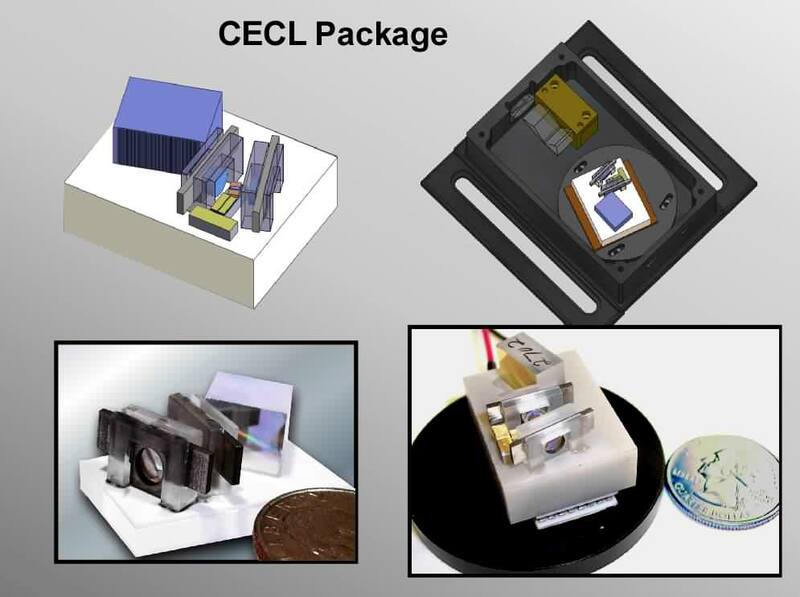 To exploit the benefit of a short cavity, non-mechanical laser design, but with center wavelength flexibility and a more narrow linewidth than DFBs or DBRs, we developed our chip external cavity lasers (CECLs). These lasers exploit a Littrow external cavity architecture, wherein the wavelength selective element is outside of the semiconductor gain medium. For our designs, this can be either a surface reflection grating or a volume Bragg grating. In this manner it is similar to conventional ECDLs. Our design differs because we engineered the cavity so that the external grating is mounted as close as possible to the gain chip, providing the advantages of a short cavity. The total cavity length is on the order of millimeters, providing a free-spectral-range that is an order of magnitude larger than for conventional EDCLs. We also have removed all piezo and mechanical structures, since they provide a path for noise to couple into the cavity. All of the cavity elements of the laser are mounted onto a monolithic ceramic block with telecom style alignment fixturing. The laser output is typically from the back facet of the Fabry-Perot diode. At the time of ordering, the customer specifies the desired center wavelength, which we then fix during manufacturing. Because this is set at the time of manufacturing, we can set this to anywhere within the diodes gain curve. Furthermore, since we are utilizing simpler Fabry-Perot diode chips, we have access to a much wide range of wavelengths. The simple, non-mechanical construction ensures that when the customer unpacks the laser and turns it on the frequency will be within a few GHz of their requested frequency. For alkali atoms like Rb and Cs we can guarantee that the laser will arrive on the D2 or D1 Doppler broadened transition. Slight adjustments to injection current will put it on top of the desired Doppler-Free hyperfine transition. Because the cavity length is larger than with a DFB or DBR, the linewidth is also less. 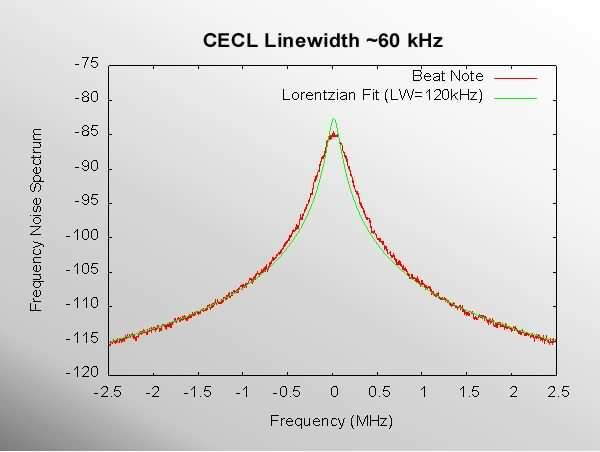 Typical CECL linewidths are on the order of 50 kHz as measured by beating two independent lasers together. Furthermore, the linewidth is very Lorentzian, i.e., it is not a smaller line width that is rapidly “jittering” around, as with longer cavity lasers. The laser tuning is controlled the same as with a DFB or DBR. Coarse wavelength tuning is done by temperature tuning the grating element. Short frequency tuning is done with high-bandwidth injection current. 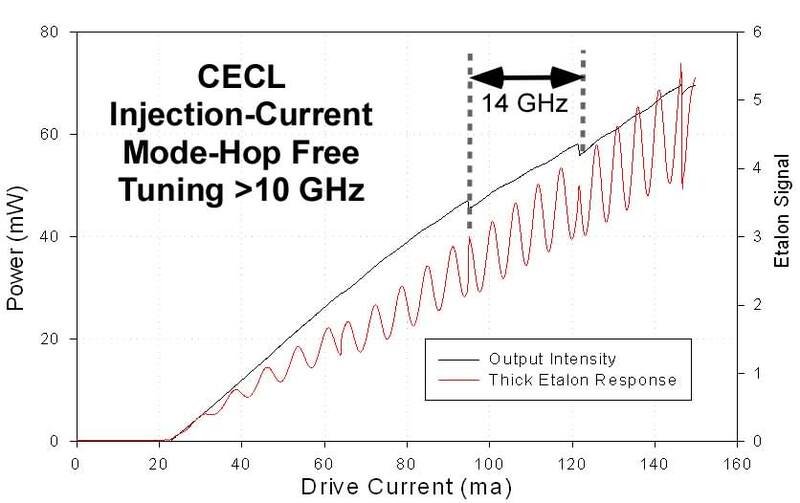 The injection current mode-hop-free tuning range is more than 10 GHz, sufficient for tuning across a hyperfine set in Rb or Cs and for providing tight, vibration tolerant locking.